How long is Lifehack going to continue to be a beta? It seems like Lifehacks has been in the Beta stage for a long time. When is lifehacks going to come out as a full site? Or is Beta just part of the title? 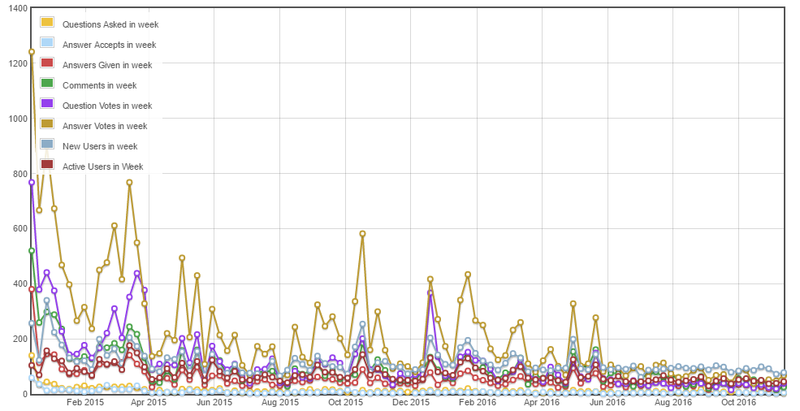 Here's a graph of or activity as a site, from when we came out to now. Note the drop off in questions (causing a drop off in all the other areas as well). Like Robert said, it is absolutely fine to not be graduating. It's better that we focus on post quality, than to try to artificially boost site activity. That being said, lets try to have a welcoming environment for new users, and make the learning curve as painless as possible. That will indirectly help with the quantity of material we're getting. The short answer is until you reach 10 questions/day. But the word "beta" doesn't really mean the same thing you've come to know in the typical software life cycle. I've been a long-time proponent of removing the "beta" label when the site is no longer in testing, but as it stands now, a site will continue to be in beta until it consistently receive about 10 questions/day. That's a pretty big site, so please understand that it is perfectly acceptable (and sometimes even expected) that you may never reach that point. There is no specific time frame where you are expected to get out of beta. You can retain that beta label essentially forever and have a perfectly functional site. This site is for discussion about Lifehacks Stack Exchange. You must have an account there to participate. Is there anything that isn't on-topic here? Saving “Lifehacks” — Can we make this a topic space instead of a vague buzzword? What's the difference between a Lifehack and a DIY solution? What is the general premise regarding lots of questions with answers from the same user? What will happen on day 90 of Lifehacks public beta?